Themes, an awesome activity history viewer, and all the rest of Trillian’s great features will now be available to everyone! This is an exciting step forward and means our users will always experience the best products we have to offer. To continue to reward our amazing paying customers, Trillian Pro will carry on as a way to contribute to our development efforts directly, hide ads across all versions, and unlock the ability to store your chat history online. We hope you’re as excited as we are and will continue to support Trillian and spread the word. Trillian for Windows' clean and pleasant user interface has been carefully designed to smoothly integrate with Windows 7. Never miss a message again. 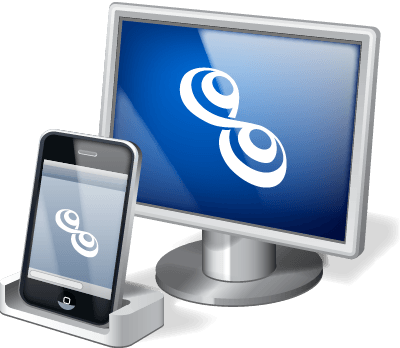 Trillian's chat history can be automatically shared between desktops and phones. Our newly-supported Foursquare plugin lets you meet up with new friends and discover new places. Stuck on a netbook with a tiny screen? No problem. Switching between our full and compact user interfaces is only a click away. e UI is designed with Windows in mind. Our Trillian Cordonata skin is designed to fit the colors of Windows XP perfectly, while Trillian also supports stunning Aero Glass effects in Windows Vista. Your contact list can float or be docked as a "sidebar", making it easy to access your contacts by moving your mouse to the side of the screen. Notifiers appears near the clock on your Windows Taskbar, informing you of your newest tweets, latest chat messages, and more. A simple drag and drop of files, text, or links allows you to easily share media from Windows Explorer and most major web browsers. A change on the Facebook side meant that international users suddenly started seeing junk characters in their chat messages instead of properly encoded characters. With Outlook.com now supporting the popular IMAP protocol, Trillian’s ability to monitor these email accounts has improved leaps and bounds. See your full mail preview, mark messages as spam, delete messages, etc. In addition, we’ve fixed bugs specific to Yahoo mail, improved our bandwidth consumption when dealing with large messages, and tweaked a few other mail-specific bugs as well. As more and more of our customers adopt our Trillian Server in-house business solution, we’re also making sure all of our client software can properly connect to an in-house server. Trillian 6.0 accomplishes this for the Windows side, making it possible to connect to servers with self-signed TLS certificates and more. A few long-standing bugs have been addressed in 5.4, including a few very rare corner cases with message window flashing, improvements to group chat windows, fixes to spellcheck, and a few other great tweaks that long-time users will appreciate – including the removal of the tooltip in the edit area that annoyed so many of you! Last but not least, our Twitter engine gets a few nice enhancements in 5.4: see user displaynames and usernames in your stream, fixes for direct messaging, fixes for RTs being cut off, and more.